It’s been one year since you were elected as Vancouver’s first Green city councillor. You should probably be congratulated for your accomplishments, but I’m sorry to say I’ve been disappointed with your first year in office. I voted for you because I thought you’d champion environmental causes at City Hall. You know, the issues you highlighted in your platform as reasons for electing you: promoting sustainable living, completing the residential bike network, creating a swifter transition to zero waste, and changing building codes to include passive solar designs and green roofs. I haven’t heard a word from you on any of these issues, but maybe I haven’t been paying enough attention. So I took a look at all of the news articles and blogs that quoted you in the past year. You’ve been vocal on trying to create an opt-out program for BC Hydro smart meters, opposing high-rise development in the West End, opposing high-rise development in Mount Pleasant, opposing mid-rise development in Arbutus Ridge, opposing mixed-use development in the Downtown Eastside, opposing any development in Dunbar, amending dog leash bylaws, and opposing alcohol at city golf courses. If I was anti-development or a smart-meter conspiracy theorist I might be excited, but I’m not. I guess it’s possible the media hasn’t done a good job portraying your efforts. I know there is a lot of work that goes into council meetings that the media doesn’t report on. I searched City Hall’s meeting minutes to see if you’ve been advancing environmental issues there, but the only proposal you put forward that is environmental in nature is a letter to Kinder Morgan opposing their pipeline. Your website is also sparse on promoting environmental issues. It shows your opposition to the pipelines, but not much else. There are a lot of important (and sometimes controversial) environmental issues being discussed at City Hall right now – composting programs and waste reduction, separated bike lanes for Cornwall and Commercial Drive, a bike-share program, car-free Robson Square, road diets, congestion charges, a better pedestrian crossing on the Granville Bridge, removal of the viaducts, water metering, urban agriculture, etc. If you won’t take a stand on these issues and be a champion for them in the public, what was the point of electing Vancouver’s first Green Party city councillor? You’ve taken the words right out of my mouth. It’s like she’s decided her niche for reelection is just to be anti-development. How disappointing… and what a contrast from Elizabeth May, who is making such a contribution. But then, during the campaign she cynically tried to court transit users by blaming cyclists for slow buses… so I didn’t really have such high hopes for progressive policies from her. I hope you’ll send her your letter! Agreed. 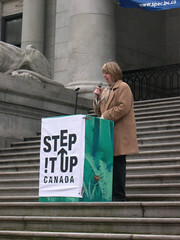 Elizabeth May is one of my favourite MPs. I emailed my letter to Carr. I think she’s in trouble next election if she doesn’t change her focus. She won last time because of a combination of enviro and NSV votes. But NSV candidate Elizabeth Murphy only got 19,644 while Carr got 48,648. An anti-development platform alone wasn’t enough to get elected last time and likely won’t be next election either. Plus yes votes to many of the other issues you raise.